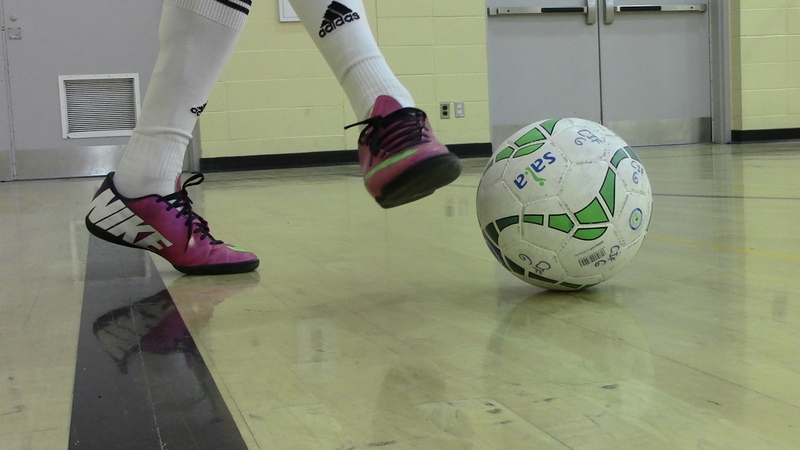 Kick-ins form a very distinctive part of Futsal. This is a slightly old video on the restart but covers all the basic details. 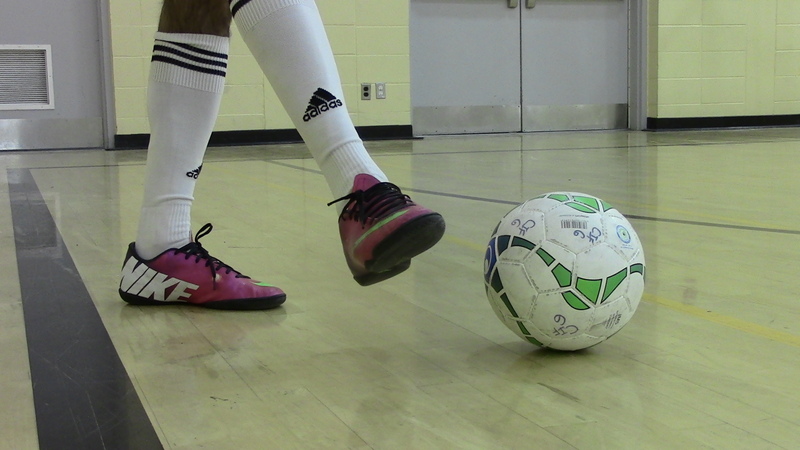 I will try to cover a few ways on how to deal with kick-ins in Futsal with common mistakes. The two main focuses will be on the two things you need! Feet and the ball. 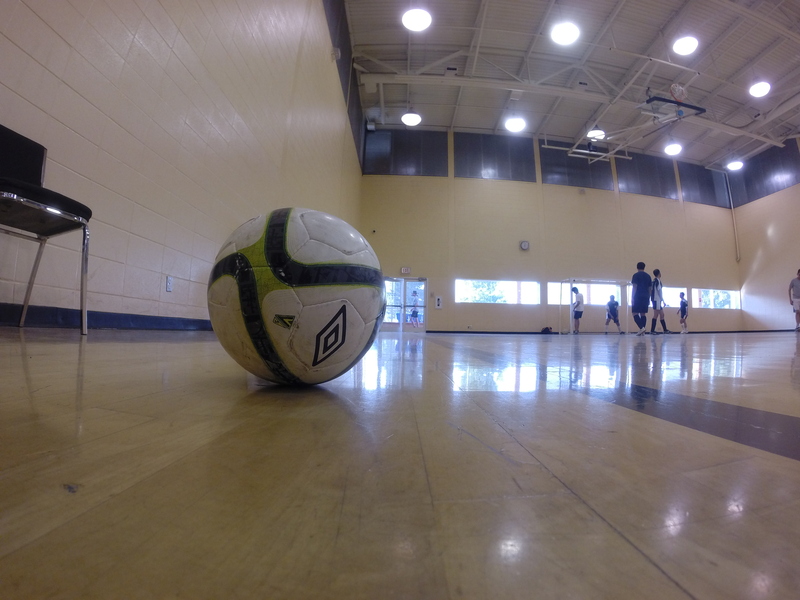 Futsal tries to focus on working with both feet. This works best when introduced to children at a young age so they can develop the necessary skills to becoming a good player. The biggest mistake typically made by players when taking a kick-in is their planted foot over the touchline. Obviously to take a kick, there will be a kicking foot and the other will be the planted foot. It’s fine if a player has a part of their planted foot on or behind the touchline. This works much like throw-ins in football. It’s only an offence if the entirety of the planted foot that is making contact with the floor is completely over the touchline and on the court as below. This also includes if the kicker’s planted foot is on tip-toe and is fully over the line. Don’t do this! Body posture of the kicker can sometimes give away whether an improper kick-in is imminent. This is the case for kicker’s adjusting their body so that they can use their preferred foot when the direction they want to kick in would otherwise require their weaker foot. One of the biggest tell-tales are kick-ins in the defensive half near the corner. Some kickers position themselves behind the goal line and appear to be swinging the ball into the court; much like taking a free kick. This doesn’t work as it is an offence (planted foot is entirely on the court). This is one that is often argued. We are instructed as referees that the ball must be stationary; not necessarily motionless (this is best described by the video on foot placement technique below. This means that if we see considerable effort, as referees, to place the ball the decision is unlikely to go against the kicker. You may be asking what considerable effort is defined as. The best example is how the ball is placed. The lazy way is considered to be using the foot to place the ball. The best way is using the hands to place the ball. It is much more likely that an offence will not occur when using the hands as there is better placement of the ball and as a result, less movement. If there is an unnatural amount of movement (i.e. rolling) when the ball is placed properly with the hands, the kicker is usually allowed to re-take the kick. On the other hand, if the ball is placed with the foot and it rolls, the kick-in is awarded the other way. This is not part of the Law but how good technique is instructed. Once everyone gets in this habit, this no longer becomes an issue and works quite quickly. Disclaimer: The section above is cultural norm in Youth Futsal and is by no means mentioned in the Futsal Laws of the Game (don’t let me create a myth!). Experienced Adult Futsal players usually place the ball in the correct position with their hand on the ball to prevent ball movement. It’s important that the ball is placed at the right location either on or behind the touchline. How far behind? 25 centimetres at most. That’s the range that can be played with. Don’t go further back than this! If the ball is kicked but never enters the field of play, the restart changes hands and a kick-in awarded to the opposing team (this was a recent amendment ). Thank you for all these futsal education. I had an argument with friends about kick in which you gave a good information and hopefully can settle this. It is about a kick in that went out of bound. I ll bring this to our game. May I know your background referee experience and are you still active? Yes, I’m an active Futsal referee having come into Futsal two years ago. You can see when I started on this blog! I’ve run all these pages by senior referees as well to verify the information is correct. Thank you for providing information on Futsal. Regarding kick in, can I say most times player placed the ball on touch line and when the player kick out of bound, the ball will change possesion? How often do you see player put the ball behind the touch line for kick in? Placing the ball behind the line doesn’t happen often since players psychologically prefer placing on the line but is a good habit to get into in the case of a bad kick to retain possession. The ball would change possession if it was on the line and kicked directly out – “Foul kick-in”. Please note now that with the recent Law changes that the possession will change hands whether on the line or not if it doesn’t enter the court. Great clarification of the kick in and what happens when the ball never enters the field of play. The most difficult aspect is to have the ball still when taking the kick since they are all in such a rush to play quickly. That’s why we generally recommend placing with hands to players. Is the penalty, direct kick, for a keeper handling the ball outside the box in futsal? I know outdoors it is, but am wondering if the same rules apply in futsal. They do not always follow USSF rules. Thank you for your response. If the keeper deliberately handles the ball while the ball is in play outside the penalty area, a direct free kick is awarded at the point where the offence occurred. The goalkeeper cannot be guilty of handling the ball inside the penalty area. The penalty mark is located 6m from the goal line at the centre of the penalty area line and is only used in the case of penalty kicks. Is it considered a second touch violation if the keeper, after making a save drops the ball to himself and plays it with his feet and or rolls it to himself outside the box? Nope. This is all within the four second count however. Second touch can be a misleading phrase as it is colloquial (not LOTG vernacular). Second possession is a better way to describe it in this context. Can the ball be played by an opponent if the keeper makes a save then drops the ball to his feet while inside the box? Does the ball have to clear the box before an opponent can play it? I am aware of the 4 second rule. Your answers have been extremely helpful and clear. Yes the ball is in play this whole time so anyone can challenge/play the ball when the goalkeeper drops the ball at his feet after a save. If the keeper throws the ball past the midline without being touched, the penalty is an indirect kick from the midline? Goalkeeper can throw the ball anywhere onto the field of play that he wants. No offence. That rule is more common in arena football where there are no out-of-bounds and throwing the ball long distances can ricochet and give an unfair advantage. The ball can easily go out of play in Futsal so it’s a much more difficult task for the goalkeeper to throw it further and keep it in play. They cannot score from throwing it however. Ok, looking for a bit of guidance here. In our local comp there are 2 schools of thought regarding Kick-Ins. One way is as you have described here – as long as any part of the planted foot is touching the line during the kick-in, it is legal. The second way is to call it a foul if any part of the foot is over the line – like one would call a long jump. The rules, FIFA 2014/15 are not explicit in saying which way is correct. So, I am interested in understanding how you came to your assessment as described above. Have you come across different ways to call a kick-in foul based on the planted foot? And do you know of any FIFA resources that shows which way to plant to the foot to make it completely clear which way is a foul or not? A kick-in is the same concept as a throw-in for soccer. Any part of the plant foot on or behind the line is acceptable.